They’re in the NBA now — as part of one of the most elite sororities in the game. The league also promoted Mousa Dagher, Matt Myers and Phenizee Ransom to the full-time level. Dagher further adds to the diversity of Thursday’s moves — he was born in Syria and moved to the U.S. as a 15-year-old in 2006. Myers spent more than a decade in the G League, and Ransom was there for six seasons. “It’s very unique, how quickly it’s happened,” Sago said. There will be a day when Moyer-Gleich, Sago and Holtkamp — along with any other women who follow them, something that seems quite likely with 17 other women working games in the G League this season — will get judged like any other referee, without the ‘female’ disclaimer. They all know that day isn’t here yet. The NBA has made hiring more women throughout the league a top priority, and that extends to the refereeing roster. 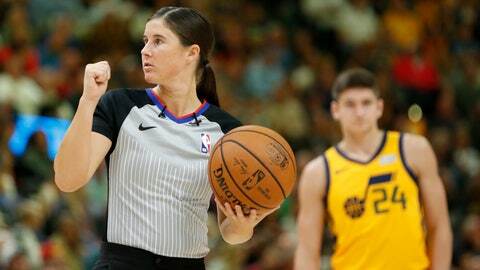 Over the summer, NBA Commissioner Adam Silver said it was “a bit embarrassing” that the league currently has only one full-time female referee.